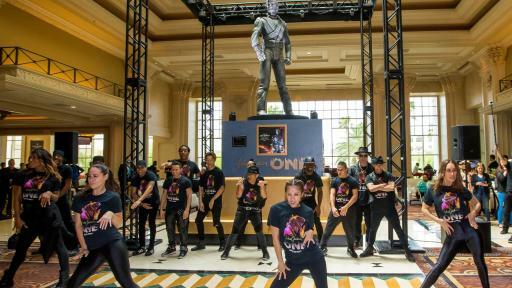 On Thursday, July 28, the Estate of Michael Jackson teamed up with Michael Jackson ONE by Cirque du Soleil and Mandalay Bay to pay tribute to the King of Pop as they unveiled his iconic HIStory Statue. 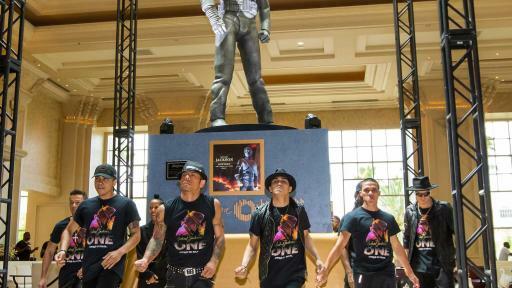 Featured on the cover of his world-famous album HIStory: Past, Present and Future Book 1, which became the best selling multiple disc album worldwide, the HIStory Statue is the third piece of memorabilia to be loaned by the Estate for display on the Mandalay Bay property. 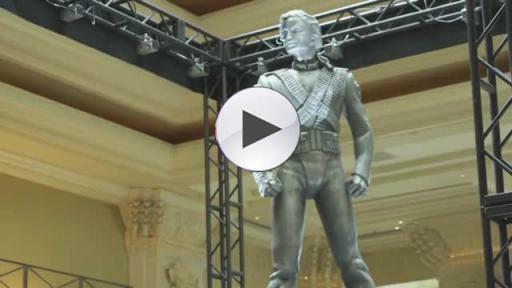 The highly anticipated unveiling ceremony took place in the Main Lobby of Mandalay Bay, where fans had the opportunity to witness the live reveal of this historic sculpture. 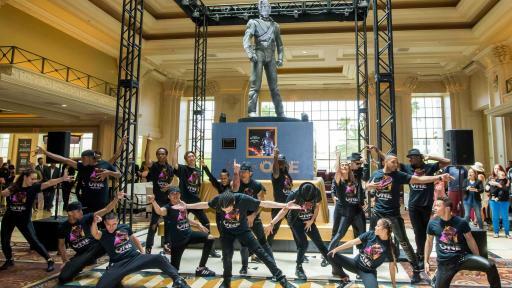 To welcome the piece, members from the cast of Michael Jackson ONE delivered a never-before-seen performance created especially for this event, dazzling the audience as they performed to “SCREAM,” the first single from the HIStory album. Following the performance, fans were able to meet and take photos with those cast members. 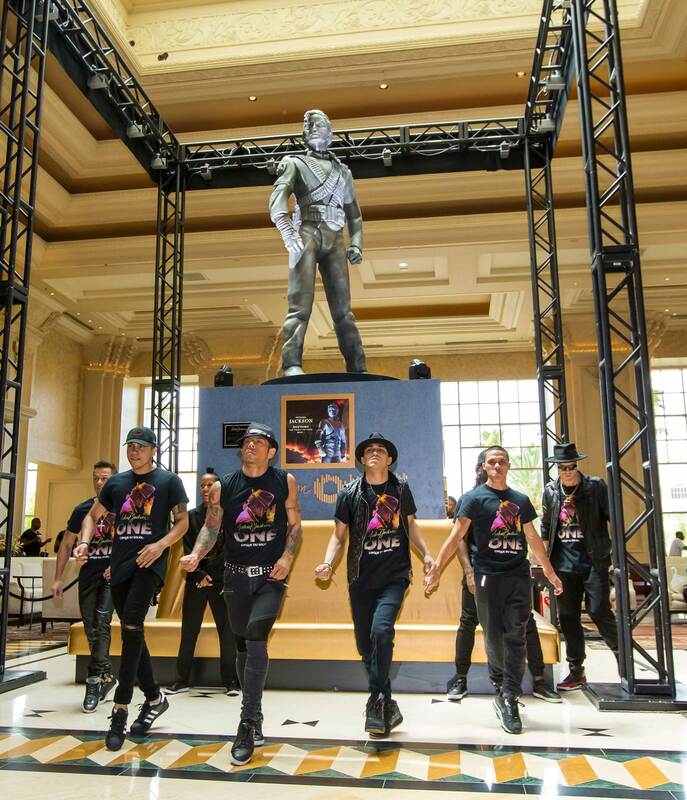 On loan from the Estate of Michael Jackson, the HIStory Statue joins two other pieces at Mandalay Bay: Jackson’s red and gold military-style jacket from his appearance at the 1984 American Music Awards and a pair of his iconic black loafers and crystal-encrusted white socks. An additional historical Jackson item will be revealed on Saturday, Aug. 27, kicking off a three-day birthday celebration for the King of Pop inside the ONE Theater. ‘They Don’t Care About Us’ as performed by Michael Jackson ONE. From a group of 20 street performers at its beginnings in 1984, Cirque du Soleil is now a major Quebec-based organization providing high-quality artistic entertainment. The company has close to 4,000 employees, including 1,300 performing artists from close to 50 different countries. Cirque du Soleil has brought wonder and delight to more than 160 million spectators in 400 cities in sixty countries on six continents. In Las Vegas, Cirque du Soleil has seven permanent resident shows. 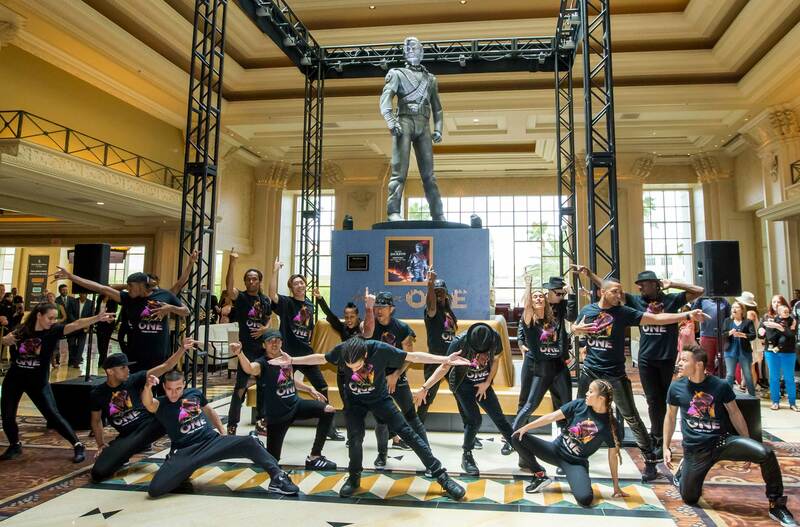 In addition to Michael Jackson ONE, these productions include Mystère at Treasure Island, “O” at Bellagio Resort & Casino, Zumanity at New York-New York Hotel & Casino, KÀ at MGM Grand Hotel & Casino, The Beatles™ LOVE™ at The Mirage Hotel & Casino and MINDFREAK® LIVE! at Luxor Hotel & Casino. For more information, visit the Cirque du Soleil website at https://www.cirquedusoleil.com/las-vegas. Like us on Facebook or Tweet us: @Cirque. Michael Jackson is one of the most beloved entertainers and profoundly influential artists of all-time. He was also a dedicated philanthropist and an astute business professional. To date Jackson has sold in excess of 1 billion records worldwide, released 13 No.1 singles and became one of a handful of artists to be inducted twice into the Rock and Roll Hall of Fame. The Guinness Book of World Records recognized Jackson as the Most Successful Entertainer of All Time and “Thriller” as the Biggest Selling Album of All Time. Thriller has also become the first album in RIAA history to reach 3X Diamond status with sales in excess of 30 million copies in the US alone. Jackson won 17 Grammy Awards including 8 in one year, a record in itself, and received 26 American Music Awards, including the Artist of the Century Award. Jackson defined the art form of music video with such ground-breaking short films as “Billie Jean,” “Beat It” and the classic “Thriller,” which in 2009 became the first and only music video inducted into the National Film Registry of the Library of Congress. In his short films “Black or White”, “They Don’t Care About Us”, “Bad and “Smooth Criminal” and others, Jackson set an aesthetic standard for music video production that remains unsurpassed even today. The Estate of Michael Jackson and Cirque du Soleil have produced two top shows: Michael Jackson THE IMMORTAL World Tour which remains one of the top grossing tours of all time; and MICHAEL JACKSON ONE, a permanent show at Mandalay Bay Las Vegas, which continues breaking box office records and receiving critical raves. Jackson’s sound, style and dance moves continue to inspire today’s performers and new generations of fans worldwide continue to discover his artistry through projects like the critically acclaimed documentary MICHAEL JACKSON’s Journey From Motown To Off The Wall, produced by Spike Lee, John Branca and John McClain and directed by Spike Lee, which offers an insightful chronicle from Michael’s early rise to fame through the release of the seminal album.